Last week I was visiting the University of Queensland, which aside from having a beautiful campus, is the home to an astonishing success story, the three minute thesis. It’s astonishing because the first three minute thesis competition only took place at UQ in 2008 and now just eight years later 350 universities are involved in 18 countries. And when I visit universities around Australia or New Zealand or the UK they are all busily getting ready for faculty heats or university finals or for the national and international competition. And the term three minute thesis is in common usage as though it had existed forever. So while I was at UQ I thought I’d find out more about how it had come about. I spoke to Selina Weller, Engagement and Development Coordinator, who is responsible for organising the 3MT and also a good friend Tony Miscamble who was there at the start. Tony told me that the Dean of the Graduate School at the time, Alan Lawson, had the original idea and then Alan, the Deputy Dean Christa Critchley, and Tony workshopped the design to be more-or-less what it is today. In 2010, 27 Australian and four New Zealand universities took part in the first trans-Tasman competition. And now it’s spread to 350 universities and 18 countries. The idea is simple. You get three minutes and one slide to explain your research to a non-specialist audience. The challenge is to condense two or three years work into something meaningful in three minutes. I’m a great supporter. 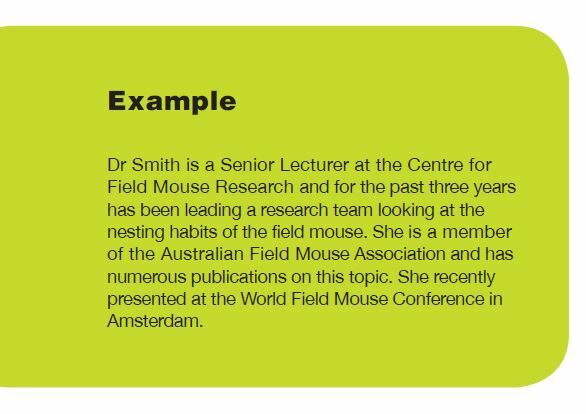 I think it’s a great chance for research students to develop their presentation skills, to learn how to make their research accessible and to develop their confidence. Of course it’s nice to win but with the 3MT the real benefit is the experience and confidence you develop. It’s happening at a university near you right now. If you don’t know much about it go along to the competition and see how it works. Maybe next year you might give it a go. And if you are involved good luck and enjoy the experience. We make up our minds about people very quickly. Think about talks you’ve been to. Sometimes even before the person speaks you’ve already formed some opinion about him/her, for example, confident, unsure, dis-organised. If you make a good start both you and the listeners will be much happier. Usually at the start of a talk people’s attention is very scattered. Some of them are busy trying to find a seat, talking to the person beside them, wondering where the handouts are, did they turn off the iron, who is the person beside them and so on. You need to get their attention. Ironically one of the ways to get their attention is to say nothing. That’s right – just pause for a few seconds while you get organised. This is your chance to build your credibility – to explain to them why they should bother listening to you. 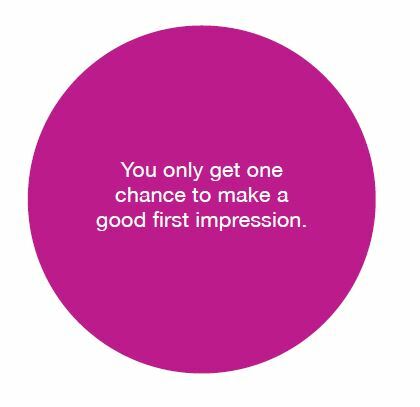 Use this opportunity to create a good impression. This is not the time to say “This is my first talk” or “I’m sure you know more about the topic than I do”. If you’ve been asked to give a talk then someone must think you know something. This is where you explain to the audience what you are going to talk about and the approach you are going to take. You will probably refer to the take-home message and explain why they should listen to you. You use the beginning or the introduction to set the scene for the talk and to overview the territory you’re going to cover. At many conferences there will be a Master of Ceremonies (MC) or a convenor who will introduce the speakers. I’ve done this job and part of it involves searching for interesting things to say about people. Usually you go to the abstract or whatever information has been provided. So it’s important that you give the MC some good information. Think about how you’d like them to introduce you. Write it out and give it to the MC beforehand. This way you are not challenging the experts, simply reporting what you have found. They might disagree with your approach but it’s harder to disagree with what you’ve found. As I’ve said it’s important to make a good start so here are some techniques to use. I have been studying the field mouse for X years. You could start your talk by telling a relevant story. Clearly the story needs to be relevant! You could start by using a case study from the data to highlight a point. A question can be a good way of getting attention at the beginning of your talk. For example: Have you ever wondered what field mice get up to after dark? Does anyone know how many field mice there are in Australia? You could use a famous quotation or comment if it is relevant to your topic. 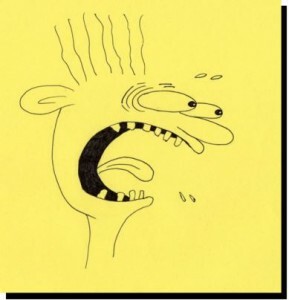 You can use a cartoon or image as a way of opening your talk. Just find one that has some relevance to your topic. There may be something topical in your field or in current affairs at the time. What is on the front page of the newspaper? Is there some way you can link this to your topic? The problem with using humour is that you need to be very good at it. Not everyone can tell good jokes or stories. Remember that some people spend years training to be professional comedians and even then some of them are not very good! People have different senses of humour. So be careful about using humour. If you do tell a joke you must memorise it and practise it. Jokes depend on timing and remembering the punchline! Once the opening lines are over, most people settle down from hysteria to normal levels of panic! How do get better at tennis? Practice, practice, practice. How do you get better at giving a talk? 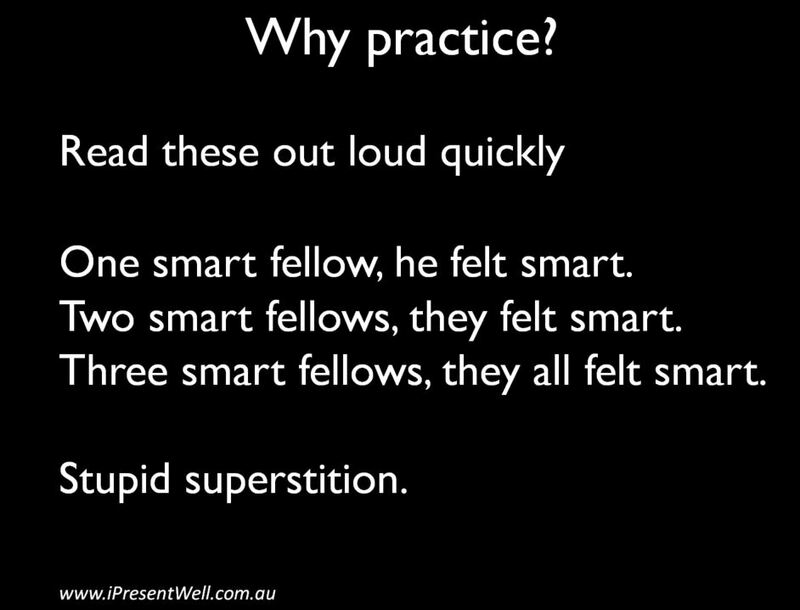 There are different types of practice. Let’s look at them. Read through what you are going to say. See if there are gaps or any changes you want to make. Match up your notes to the PowerPoint slides. It’s a good idea to note the slide number (or name) on your notes. Speaking is different from reading. When you read it out loud you will become aware of how the words flow, awkward sentences, and where pauses and emphasis should be. If you do want to stress certain words then underline them or highlight them. Remove tongue twisters and words that you find hard to say. Practice it with some background noise, like a radio or a CD playing. When you really deliver it there will be background noise such as people moving around, doors opening and closing. You will need to speak loudly enough to be heard. I know it’s embarrassing but if you can get someone to listen to you they can give you some feedback. Make sure it’s a kind person. It will also give you a sense of what the talk sounds like when someone is listening. Your dog or cat is unlikely to be too interested in your topic but they won’t say nasty things either! When most of us present in public we get anxious and tend to speak faster. I think we are trying to get to the finish point quickly which can leave a big gap at the end. Or you might get distracted on some point and spend a long time on it meaning you run out of time towards the end. Either way it’s useful to have a sense of the timeframe for your talk. The way to do this is to note on your script the time at different parts. For example, how long did the introduction take, when you finish the first point how much time should be gone? 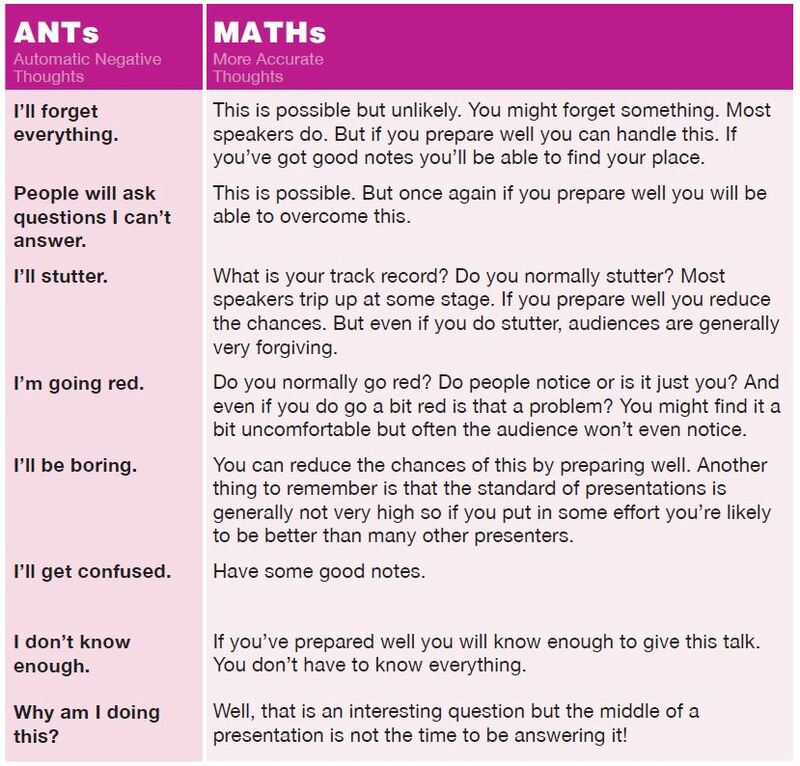 This will be useful when you are delivering your presentation as you can see if you are ahead or behind. If you are ahead of time then you can make yourself slow down or elaborate on certain points. If you have fallen behind time then you may have to leave out some points. Practicing at home is great but it’s very different from the venue. The layout will be different, the place to put your notes and your water, where you will stand. Being in the venue gives you a much better sense of what the talk will be like. 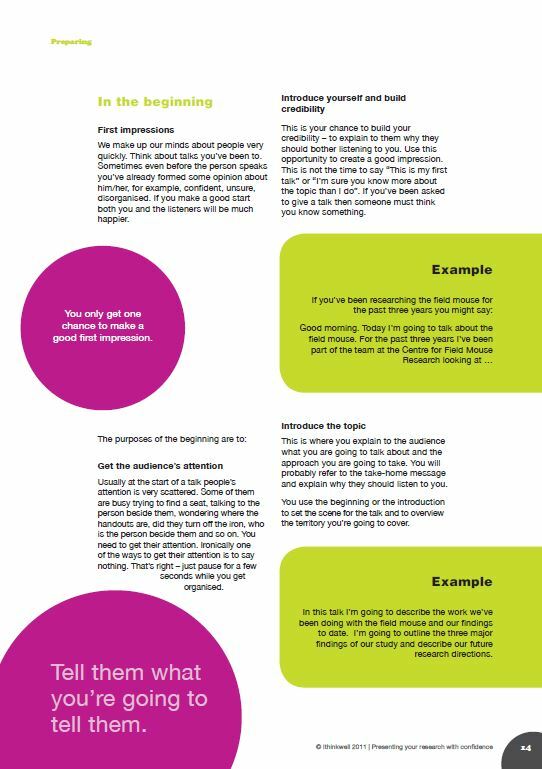 It also helps you visualise the talk and imagine yourself giving a great presentation. So if you are at a conference make sure you find your venue during a break, stand at the podium and get used to the feel of the room. Beginners make the mistake of assuming all computers are the same. “If it works on my computer at home it will surely work in the presentation venue.” They are almost invariably wrong. Firstly the software may be different, or a different version, or may do funny things to your fonts or images (this is a good reason to use standard fonts in your PowerPoint). Secondly the physical computer will be different. The buttons may be in different places, the USB drive may be in a different place, there might not be a mouse so you have to use that microscopic toggle thing in the middle of the keyboard. Even a simple task of pressing a computer key can be a challenge when anxiety has turned your hands into paws. A very common problem is getting to the venue and starting to load your presentation only to find that a password is required. And you don’t know it. And nobody else knows it either. Or even more basic – that the cabinet the computer is in is locked and you can’t put your USB memory stick in. All of these things have happened to me (once!) – and all can be prevented by checking out the venue. 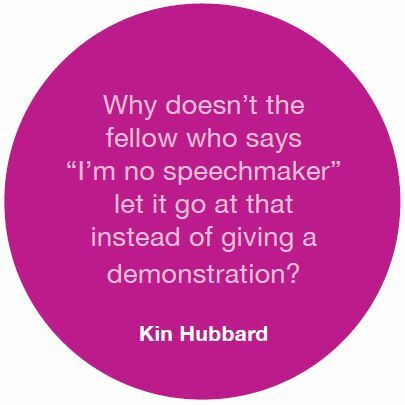 A strategy some people use is to think of a speaker they admire. Then imagine how they would present. Visualise their confidence, their presence. Now practise your talk but imagine you are them. Take on some of their qualities for your presentation. It’s a good idea to learn your opening few lines off by heart. This is when you will be most nervous. If you can get off to a good start it calms you down for the rest of the talk. If you have a particular opening you use regularly, then learn it by heart. It’s a scary thing to listen to yourself on an audio tape. It doesn’t sound like the you, you know. That’s because we hear our voices from inside our head while others hear the real us. It can take a while to get used to hearing your own voice. But if you can bear it, it will help you work out where you might change your pace, emphasis, clarity and volume. Even more daunting is to watch yourself on video. Most people’s reaction is to say “I don’t look like that do I?” Once again it will give you insights into how you come across. But generally I only recommend this once you have developed some confidence. 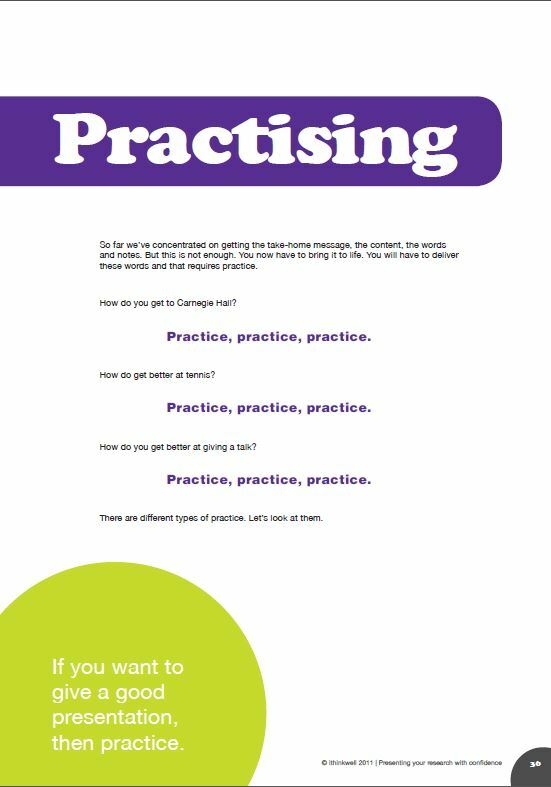 And finally – practice, practice, practice. These are very normal thoughts. Most speakers, even confident ones, will have some of these thoughts. In psychology these are known as Automatic Negative Thoughts – ANTs. This means they are automatic. You didn’t ask to have them. They just pop into your head. And they are negative because, well, they are negative! And having these thoughts, these ANTs, is very likely to make you feel anxious. In fact they’re what make you feel anxious. But just because you have the thoughts doesn’t mean they’re true. Let’s look more accurately at the thoughts and try to find what I call the More Accurate Thoughts (MATHs). a bit. You might find it useful to actually write down your Automatic Negative Thoughts and the more accurate challenges. First of all it’s useful to know that most people, and many accomplished speakers, find question time a bit daunting. It’s not just you! One of the reasons people find it scary is that it’s unpredictable. With your presentation you can prepare and you know what you will say. But with questions you have less idea of what will arise. You are a bit more at the mercy of the audience. However you can still prepare. Here are a range of strategies. In reality, question time should not really be about the audience checking out your specific knowledge, for example, name the planets in the correct order. Usually it is for general questions about your approach, clarifying your reasons for particular decisions and raising other approaches. So you don’t have to know every fact in the universe and you can predict some of the obvious questions. Imagine you were part of the audience. What questions would pop into your head? Get a friend to listen to your talk and then ask them what questions they can think of. Because you know the topic well (hopefully) you should be able to identify the more obvious questions. Then try a bit harder to imagine the less obvious questions. Imagine the different types of people at your talk. What specific interests might they have? What matters to them? Obviously, once you’ve identified the questions you need to prepare plausible answers. One of the problems with question time is that you don’t have much time to think of a clever response. (This is made worse of course by 80% of your brain cells being consumed by anxiety.) So here are some ways to buy some time. “Thanks for that. So your question is [insert question]. Hopefully while you are saying that, something clever (or even anything at all!) pops into your head. You can also use the audience for help. Once again while you are waiting, hopefully you can think of a response. You could even return the question to the questioner! So while question-time might not become fun for you there are strategies you can use to make it less daunting. Should you be talking at all? A checklist. If you’ve put in an abstract for a conference and been accepted, then we can assume you want to present and you’ve got some idea of the topic. However there will many other times where you are asked to present, for example department seminars, guest lectures, community groups. To increase your chances of success there are some questions you should ask right at the start. Use the following checklist to help decide if you should be talking at all. Is this the right topic? Just because someone has suggested a topic for you doesn’t mean you can’t change it or negotiate parts of it. Do I know anything about this topic? Can I change/select the topic? You may be able to suggest a better topic or one you are more comfortable with. You might want longer or shorter. Do I have the time to prepare for this? To do it properly will take time. Have I got the time? 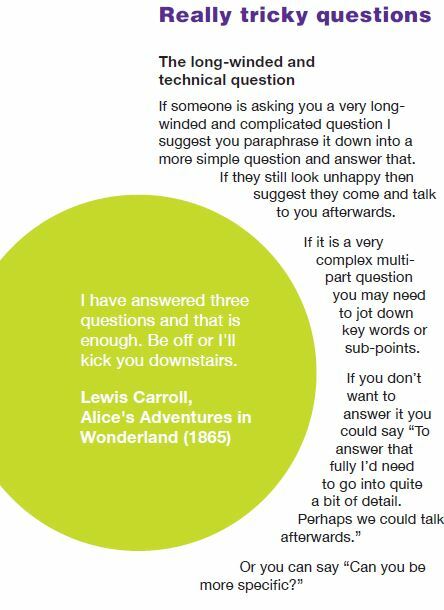 Once you’ve answered these questions then make a rational decision about whether to accept, to negotiate something different or to decline. You need to find out how questions are going to be managed at your presentation. For some presentations it will be quite clear, for example, they might state that in your fifteen minute presentation, you present for ten minutes and allow five minutes for questions. In other cases it might be up to you. Sometimes the convenor or Master of Ceremonies will manage the question time for you. Sometimes people might want to ask questions as you go through the presentation. Check all this out beforehand. Contact the person organising the event and find out what the expectations are. If you are a novice or nervous presenter it is probably best to keep the questions till the end of the presentation, otherwise you may get a bit lost with your content or the timing. If the format is that you present for ten minutes and allow five minutes for interaction, this is probably enough time for three or four questions. If the talk is longer, say 45 minutes, then you would probably allow 10 to 15 minutes for questions. For some speakers a bigger fear than difficult questions is getting no questions at all. Then there’s that horrible silence which seems to drag on forever. So here are some ways to invite questions. As you get to the end of your talk you say “In a moment there is some time for questions. Before that I will just recap some of the major points.” And then you highlight some of the areas where there might be questions or you might like people to ask questions. If there is still a silence you can create your own question. For example you could say “One of the things people regularly want to know is [insert question that you know the answer to]”. This can sometimes get the ball rolling. Another strategy is to place a confederate or stooge in the audience. You give them a question beforehand. (Obviously one that you know the answer to!) You can do the same thing with the convenor. You would say to him/her “When I finish, if there aren’t any questions please ask this question”. If there are no questions, and this often happens, then say “I think that’s it then. Thank you for your attention” and leave. Remember there may be several reasons people don’t have questions. They want to move on to the next talk, or they have somewhere to go or you’ve answered all the obvious questions. Most of us have been through it. Those mom ents before you are called up to the lectern to speak. It’s too late to run away or call in sick. You’re trapped. You curse yourself for the decision to put in that abstract. You curse the people who talked you into it. All the clever ideas and killer lines don’t seem so great any more. Your heart is starting to beat fast. In fact it’s thumping around in your chest. You’re starting to sweat. Your hands have become clammy and the room is suddenly very stuffy. You fiddle with your notes to make sure they’re all there. While you’re fiddling you drop them so then you have to re-organise them. Again. You struggle to pick them up because your fingers have turned into paws and they’re not connected to your brain any more. Your brain is working overtime but it’s just showing re-runs of horror movies. You falling over as you walk to the stage. You standing there and no words coming out. The audience laughing at your open fly. The impossible questions. Or worse – the easy questions, and you stuffing them up. And then it’s your turn. The next twenty minutes pass in a blur. You manage to get through it without major disaster and promise yourself that you’ll never do this again or at the very least you’ll be more prepared the next time. Most people have had one or more experiences like this. It’s not fun and it’s no wonder many people avoid making presentations. But it doesn’t have to be like this. There are some techniques you can learn that will take the terror out of giving presentations and with practice turn you into an accomplished presenter. This website and the accompanying book will tell you what they are.